June 26, 2012 — In its annual Failed States Index, The Fund for Peace organization, ranks Ethiopia at 17, sliding behind three positions from the previous year. 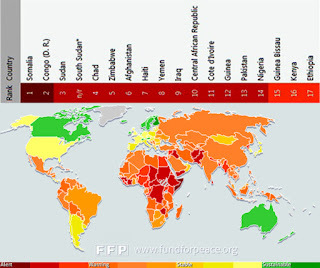 Citing mounting demographic pressures, increased security apparatus abuses against civilians, the rise of factionalized elites, and rampant human right violations within the country as a critical areas of concern, the non-profit organization gave Ethiopia a dismal score of 97.9. For the fifth consecutive year, the Washington, D.C.-based research institution ranks Somalia (114.9) at the top of its index, followed by Democratic Republic of Congo (111.2), the Sudan(109.4), South Sudan (N/A) and Chad (107.6). In a similar ranking, the Global Peace Index, conducted by the Research Institute of Economics and Peace, places Ethiopia at number 10, indicating Africa's second most populous state is one of the most dangerous countries to live in.